The Ultimate Salts / 226 Salts Bundle contains one of each of the best sellers from the extremely popular Ultimate Salts Chilled range, the Ultimate Salts Sherbet range and also the 226 Salts range (total 12 x 10ml). 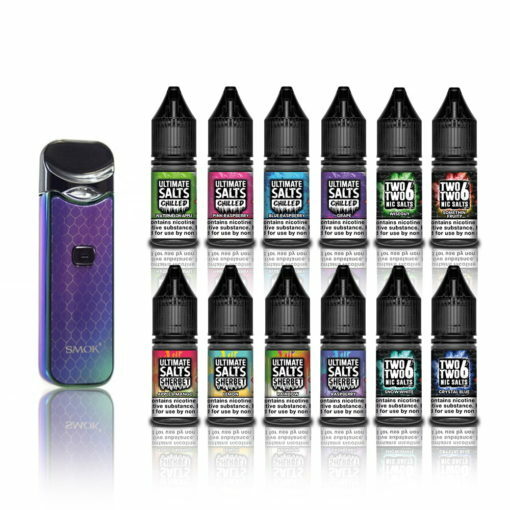 Buy this bundle of flavours and receive a FREE SMOK Nord Pod Kit. Ultimate Salts Chilled – Blue Raspberry. A perfect, smooth, refreshing blue raspberry vape with a cool and crisp bite. Ultimate Salts Chilled – Grape. A sweet and juicy grape flavour with a wickedly icy and refreshing after taste. Ultimate Salts Chilled – Pink Raspberry. Devour the taste of freshly picked pink raspberries with a frosty finish. Ultimate Salts Chilled – Watermelon Apple. Frozen watermelon blended with sweet apple. A super refreshing vape. Ultimate Salts Sherbet – Apple & Mango. Devour the juiciest apples and mangoes combined in this fresh and fruity sherbet. Ultimate Salts Sherbet – Lemon. Sweet zesty lemon infused with sherbet makes one of the most delicious vape flavours out there. Ultimate Salts Sherbet – Rainbow. Ultimate Salts Sherbet – Raspberry. This refreshingly tangy raspberry sherbet is an all day vape you won’t want to miss. Is a flavourful blend of mixed dark fruit finished with a cool aniseed punch. By far our favourite! Snow White is a perfect blend of Dark Berries with a Huckleberry infusion that will just keep you wanting more! Juicy mixed summer fruits infused with a well balanced burst of berries. For that great all day, every day vape, this one will for sure win your heart. Is a sweet infusion of sweet apple and extremely moreish mango.